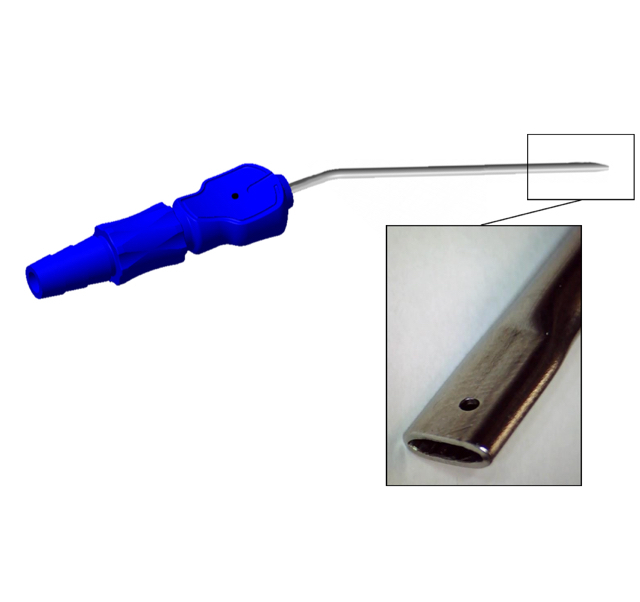 Steel aspiration cannulae for neurosurgery with flat tip complete with Ø 1,5 mm aspiration control handle. The aspiration control hole has a diameter of 1,5 mms., this allows the surgeon to receive a much slower response. When the hole is uncovered, the decrease in aspiration at the tip occurs in a progressive manner over time. Also in cases of relatively high aspiration pressures, these cannulae maintain a low noise production. Particularly adapt for use in Neurosurgery. Reduces the risk of blocking. Can dissect in restricted areas in Neuro & Spinal surgery. Cannulae are made of AISI 304 medical steel. Uniform internal diameter over the entire length of the cannula. Handle with aspiration control made of copolymer styrenebutadiene (ABS). Colour coded for immediate recognition. Packaged singularly in double sterile packaging. See also our Ball Tipped Cannula for Neurosurgery and other models of neurosurgical micro cannulae. To see our complete line of disposable suction tubes for different surgical applications, click here.